Cr Anne Salt addressing the meeting. TWO proposed developments at Willow Court will be the subject of further reports to the Derwent Valley Council in the coming months. Last night's council meeting noted proposals submitted by the Agrarian Kitchen and Crusader Homes, and asked general manager Greg Winton to enter discussions with the two developers and report back within 60 days. The meeting heard that the Agrarian Kitchen proposes to move its Lachlan cooking school to Willow Court to be co-located with its successful restaurant there, and that Crusader Homes would like to establish a rum distillery on the historic site in central New Norfolk. Earlier in the meeting, Councillor Anne Salt put forward a suite of motions based on suggestions from the Friends of Willow Court Special Committee, which she chaired for six years until its annual general meeting last week. Cr Salt's proposals included a 120-day moratorium on all expressions of interest for Willow Court; development of a single Conservation Management Plan (CMP) to consolidate the multiple individual CMPs; and waiving of the $110 site opening fee for tours provided by the Friends of Willow Court. Cr Salt was applauded by her supporters but her three motions were unsuccessful. Cr Salt declared a conflict of interest in her three motions but said she felt she did not need to leave the room as it was not a pecuniary interest. 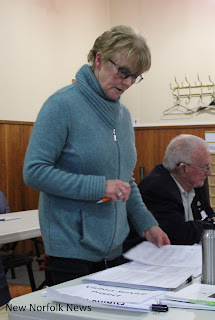 However, Cr Salt did leave the room during discussion of the proposals from the Agrarian Kitchen and the New Norfolk Distillery. An amateur history and news site operated by the Willow Court History Group yesterday alleged that reporting of one of Cr Salt's motions "by the local media in the Derwent Valley" had left out important facts, and created negative discussion and personal attacks on social media. The writer did not specify which facts had been omitted and did not explain their group's reasons for copying and pasting the offending article onto their own Facebook page despite their previous concerns about breaches of copyright. For goodness sake Cr Salt, this town needs development and these proposals both have fantastic merit. We the ratepayers have been waiting far too long for something to happen on this site and your call for more time is way out of line. Stop the negativity and look to the future. Friends of WC have done very little of any great value during your time as chair. Wow what a conflict of interest. Waiving the $110 fee for FOWC whilst other tour operators pay the fee and still donate money if not he entire profit back to the site.